Hard-wired configurations are most popular during new construction projects or for homes and businesses where it is easy to run wiring to the various locations where the owner wants to install leak sensors. Homes with unfinished basements or a crawl space are well suited for a hard-wired installation. Hard-wired systems are very reliable, economical, and do not require battery replacement. However, they require more installation labor time as wire needs to be run from the control panel to the sensors. CLICK HERE for more information on our standard hard-wired residential leak detection system packages. Wireless configurations are most popular for applications where a fast installation is required and/or it is difficult or impossible to run wire to the desired leak sensor locations (fully-finished house). 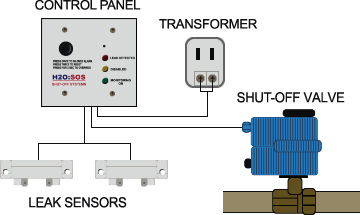 Wireless configurations require a wireless receiver and at least one wireless transmitter. These components add additional cost but, since no wiring to the sensors is required, the ease of installation can reduce installation labor costs. The transmitters require periodic battery replacement (approximately every 3 years). H2O SOS has two styles of wireless transmitters; one features a built in leak sensor, and one is designed to be wired to one of more standard sensors. Each wireless receiver can support up to 32 transmitters and each transmitter can support up to 25 sensors. CLICK HERE for more information on our wireless residential leak detection packages. Hybrid systems combine both hard-wired components and wireless components. A hybrid configuration is often used when a portion of the home or business can easily be serviced by wired sensors but there are one or two areas of the building where the level of finishing makes it difficult to run wiring. CLICK HERE to build your own water leak detection system.